Superhero Temp Agency is an improvised comedy podcast that I created for my thesis in MFA: Design at the School of Visual Arts. The podcast is about a temp agency that tries to find work for the world’s most useless superheroes, each episode consisting of a job interview between Barry Sussman, the head of the agency, and a potential recruit. I play Barry and local comedians, improvisers, and actors play the superheroes. The homepage of the promotional site for the podcast as seen on the state-of-the-art computer in Barry's office. You can visit the actual website here. One of Barry's star recruits. Just a few of Barry's star recruits/ success stories. 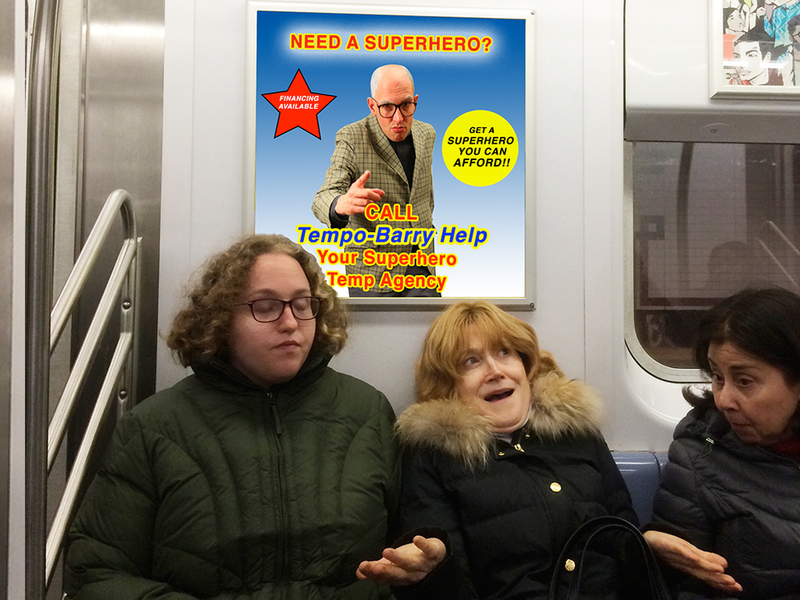 A fictional subway ad for Barry's agency. It could potentially function as a real ad for the podcast. Thanks Dr. Zizmor! These flyers would be a simple but novel way to create interest in and content for the podcast. 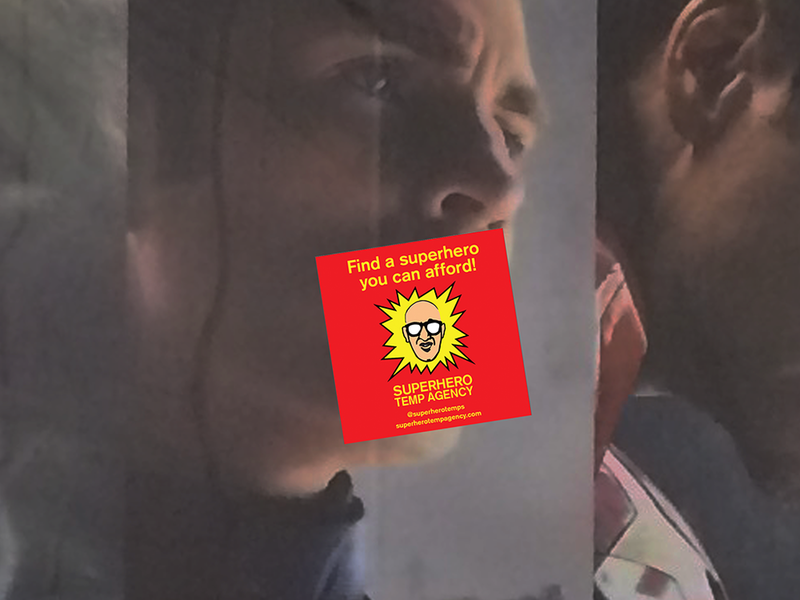 It asks strangers to leave voicemails with their name and superpower. Guerilla marketing to generate interest in the podcast. A rolodex--for the young people!-- is a piece of branded merchandise that could be used to promote the podcast in real life, while adding another visual element to the fictional world of the podcast's technologically-challenged star. What could be more up to the minute than a plastic ashtray? This could also be used to promote the podcast in real life, while simultaneously emphasizing Barry's bad taste and tactlessness. If the podcast ever came out with a live album, vinyl would be the perfect package since its host is trapped in the 70's. I presented a live pitch for the podcast as its fictional host, Barry Sussman. In this Ted-style presentation, I explained the podcast and made the case for it as a financially viable business. You can see the full performance here. A sequence of slides from the live pitch. This sequence allows Barry to demonstrate (very literally) how subscribers will grow the business. The cover of the book summarizing my research. It includes a business plan as well as marketing and social media strategy. I made this set to look like a dumpy office from the early 90's and used it for shooting the promo video and photographs. Note the period-correct computer and vintage office chair. A still from the promo video showing Barry interviewing a potential recruit. The URL goes to the podcast's promo site. A promotional video for the podcast, made to look like a cheap TV ad for the temp agency where the podcast takes place. I deliberately made the video look as bad as possible. In addition to writing the script, I produced the entire video from start to finish: directed and cast the actors, made the set, edited the footage, etc.